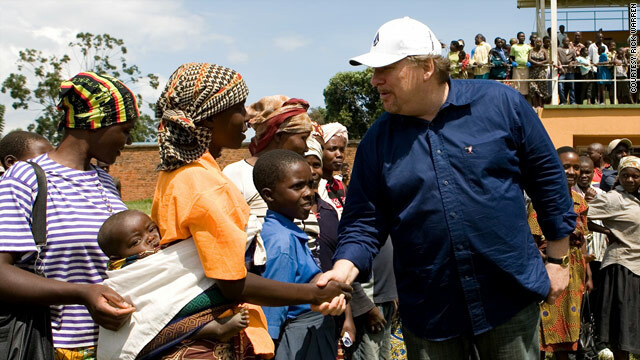 Rick Warren in Rwanda in 2008. Editor's Note: Rick Warren is the founder and pastor at Saddleback Church and the author of The Purpose Driven Life. On June 5, 1981, my wife Kay was late into her second pregnancy, just weeks away from giving birth. Absorbed in caring for our 2-year-old and preparing for a newborn, the farthest thing on our minds was news that day of a cluster of men in Los Angeles with a mysterious, devastating disease. Though late to the fight, in 2003 Kay and I heard God calling us to care for those infected and affected, to raise our voices on their behalf, and to figure out practical ways for local churches to serve them. We traveled to Africa, ground zero for this pandemic, and were brokenhearted by the pain and thrilled by the compassion we observed. Out of the bubble that is American life, we sat with dying men and women, held newly orphaned babies in our arms, and cried with shattered family members. In America, we’d heard public leaders, including pastors, make pronouncements about AIDS that implied that those infected were enemies, or at least deserved their illness. But at the grassroots level we witnessed Christ-followers by the thousands opening their hearts, their homes, their wallets and their churches to fellow human beings in their suffering. Clearly, local churches were at the forefront of this battle in Africa. 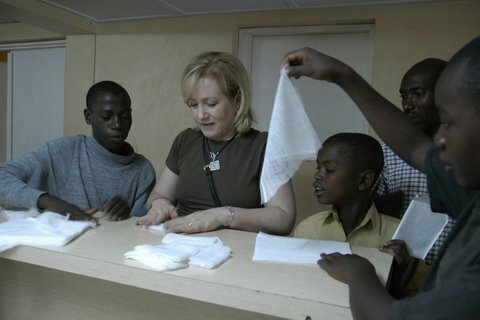 Kay Warren folding bandages in Rwanda in 2007. We returned home determined to model our church’s response to HIV and AIDS after the African church’s response. We began by inviting a member of our church – Saddleback, in Southern California - who was HIV positive to tell his story publicly for the first time. Our members responded with overwhelming love. And once people realized our church was a safe place, other HIV positive people began attending and opening up about their status. To help remove the stigma, I was publicly tested for HIV with network TV cameras rolling. We began support groups for anyone infected or affected; trained church members to be part of personalized teams for an infected individual; brought in experts in the field to educate our congregation; and hosted three “Global Summits on AIDS and the Church” to showcase the latest scientific, behavioral and psycho-social aspects of the disease. We reached out to local, regional, national and international organizations, offering our manpower and networks in the fight against AIDS. One of the great lessons of this fight is that the single fastest way to mobilize at the grassroots level around the world is through local congregations. Nothing comes close to the size and scope of this pool of compassionate volunteers. The church has the largest distribution network on the planet. There are more churches in the world than all the Wal-Marts, McDonald’s and Starbucks combined. The church was global 200 years before anyone else thought of globalization. We could take you to thousands of villages around the world where the only institution to speak of is a church. Plus, the Christian church is the only organization growing faster than the new infection rate: while 7,000 people are newly infected globally every day, and church growth experts estimate that the church is adding 35,000 converts daily in China alone. Our church sent 14,869 of our members to all 195 nations in the world to beta-test a local church humanitarian program based on the model of Jesus. Called the P.E.A.C.E. Plan, volunteers Plant churches that promote reconciliation, Equip servant leaders, Assist the poor, Care for the sick and Educate the next generation. –Care for and support the sick. Caring requires no money, just a willingness to offer compassion and kindness. –Handle HIV testing. At the least, churches can encourage members to get tested, with the pastor leading the way. Everyone should know their HIV status. –Champion healthy behavior. HIV is almost completely preventable. While new reports suggest that accessing HIV treatment at an earlier stage of the illness is a vital way to prevent transmission, the cost may be an impediment. Behavior change will continue to be the most effective way to cut down on new infections. –Help with antiretroviral drugs for HIV patients. The simplest way to cut down on new infections, to help infected individuals live longer, and to prevent children from becoming orphans, is to create accountability with medication compliance. Church volunteers can make daily visits or phone calls, reminding individuals to take their medication. This strategy has been enormously successful in the Karongi District of the Western Province of Rwanda, where Saddleback Church, the government of Rwanda and local churches established a pilot program to train community health workers. Started in 2008, more than 2,800 community volunteers have been trained through the churches to take on a caseload of 26,000 homes in the rural district where there is one hospital for 300,000 residents. These volunteers provide access to basic healthcare information and are addressing preventable and opportunistic diseases – the big killers of those living with the virus. The lives of 120,000 children and 50,000 adults are being positively impacted. Thirty years have passed since HIV was first recognized. In that time, millions have lost their lives and millions of children have been orphaned. Millions more are living with the virus today. But if the church and other faith communities will step up to the table, and as governments and other health organizations welcome their assistance, the future can be brighter. The opinions expressed in this commentary are solely those of Rick Warren. As a recently returned Peace Corps volunteer from Botswana where the PC deals ONLY in HIV/AIDS education and prevention, the church has promoted the misguided prevention plan of abstinence over condom use. The Botswana government also espoused abstinence because of George Ws beliefs bleeding over into President's Emergency Plan for AIDS Relief (PEPFAR). Abstinence only prevention has done a great disservice to the peoples of southern Africa where HIV prevalence and incidence has increased instead of decreased. Certainly condom use should be encouraged. My question is, however, do condoms ever fail to protect a person from acquiring HIV? Religion is Brain AIDS. True story! Religion poisons what again? Oh, that's right...Everything! SHAME ON CNN FOR GIVING A PLATFORM FOR THIS DELUSIONAL, INSANE FREAK!! WHY DON'T YOU ALSO GIVE PUBLICITY TO THE TOTAL SCHIZOPHRENICS BABBLING TO THEMSELVES AS THEY WALK DOWN THE STREET??? SAME THING!! Agreed. They would never let someone who preaches that interracial marriage is wrong because the bible says blacks are bad. Yet Warren preaches against gays, and though he says he loves all, he in actuality promotes bullying and gay-bashing. I would like Kerri L. Engen to have been invited to write a piece opposing Warren's self promotion. Tht would have been better journalism. As it stands, CNN offered a one sided bview of Africa. The reality is in Ms. Enger's life experience. Typical religious maneuver. Use a disaster to advance an agenda. As opposed to... Not trying to help at all? Then it would be "typical religious reaction, not do anything to help"
Warren didn't get involved until people other than gays were afflicted. He is a hateful bigot and should be ostracized by all. 'Typically' even when the church is encouraged by leaders to do the right thing – care for the sick – some anti-faith persons can't see the good because they wear blinders. You're missing the point, Christianity doesn't appear to do charity for the sake of helping people, it does charity to advertise their product. It's like watching Nascar. If it were all about giving people a good race then none of the cars would be decked out all over in advertising, right? The 'church' is nothing more than a warehouse for misguided fools. It brings nothing more than false hope to the weak. Theres an article on patriotism and athiests on the next couple of pages. Go check it out! Youd fit in perfectly. Lots back patting and congratulations going on over there. Dont miss out, go now! What's wrong, John? Didn't find anyone to listen to your lies? We can prove your god doesn't exist. Wanna try again? One over tamarlane, theyre all waiting for you. Youll have fun, go try it out. By the way tamarlane, proof and god have nothing in common. You will never be able to prove god doesnt exist. If man could prove god existed he would weaponize it. We cant even handle his word without causing global perversion. We slit the atom and made a bomb. We got the bible and killed millions. I doubt mankind can handle proof. We know about globalizations but nothing of love. We are so lost and you are stewing in it, chewing off your own leg to escape a trap you set for yourself. I think you've got that backwards. It is religious people who cannot handle the truth. That's why you believe in comforting lies. Really, what sort of dung have you been smoking? Oh you would handle the truth alright. Youd put it rigt on the end of a gun. Your idea of god and love is so perverted, how would you ever be able to handle the real deal when you believe mans lies. You are a captive. Your idea of god and love is so perverted, how would you ever be able to handle the real deal when you believe mans lies. You are a captive. There. They make more sense when I say them. I was surprised there was no mention of how the Catholic church tells the undereducated African citizens that condoms increase the chances of getting HIV/AIDs. Never mind the fact that the Catholic establishment is preying upon the lack of education and unfair gender roles to make damn sure no one uses a condom. Thats insane! I wanna read about it, where can i find that info. About the church saying that. Don't bother responding to John. He knows all that stuff already. He just wants you to waste time. He's a troll. A lying troll. Tamarlane, dont be upset and call me a liar. Where have i lied? I never lied once. You sound angry, what happened? Why am i a troll? Im just commenting like you are, how does that make me a troll. Why you so mad? And wheres that link that says the church said condoms cause aids? The first few seconds of the video state the old Pope's belief that condoms are "part of the problem" that is AIDs. After a careful reading, at no point is the word condom mentioned. If any of these "good Christians" advocated condoms there wouldnt be a pandemic....... Religion murders people with ignorance and always has, grow up, use condoms, stop worshipping a 65 year old white man in the sky that is always watching you even while you pee. I seriously doubt these people have aids because of western religion. Unless they got it secondary to having no condom as a result of Rome's policies and influence. Bucky im trying, ha ha! Gotta lotta house cleanin to do so i cant hang much longer. Last...finger....getting...weak.. Ha ha. Frankly, we don't need John here. Lying trolls are not worth having. Tamarlane. Calling me a troll for commenting is weird. Why are you upset? Its sunday! Yes, John, why are you wasting your time here? Why aren't you outside having a barbecue or going to church? When was the last time the church cured anything? Oh that's right, never. This article has nothing to do with curing aids. Unless i missed something. Good point. 27%, (last I read), of people with HIV/Aids are cared for in inst'itutions which are run by, or sponsored by, the RC church. I think that's ironic, but there are other ways to look at it. Religion has done little more throughout history than to further the misery of mankind and put people under the control of others. While it has helped a few people from time to time, mostly it just helps those doing the preaching and whatnot. It the worlds oldest business and it has cost humanity trillions in wasted time and manpower for thousands of years. Time to start looking outside of religion and the hokey people who claim to speak to god for answers. Really? You really think the church has done LITTLE throughout history? My goodness, if this is what people believe, than the church has a massive PR problem. Please research the history of christianity and look past the obvious "oh, just look at the catholic priests" or "the spanish inquisition was horrible". I also could easily say atheism killed millions more throughout history. For every spanish inquisition, I can give examples of the Stalins and Pol Pots of the world. for example, look at the history of many hospitals in the US and around the world and you will see they have foundations in the Christianity of their founders. That's just one example. Guest, how about when the church advocated things like slavery and stifled education? What about how they use the ignorance of the populace to fill their coin purses? What about the crusades? A couple hospitals pale in comparison to the fact that throughout history the Catholic church has largely oppressed and controlled its people through fear campaigns and sometimes outright torture. Your two examples are of people with secular views doing bad things. The church has done bad things BASED on its views. Just because these scientists were Christian does not mean Christianity has done anything for our society. The discoveries those people made came from questions they had and work they did. Just because they happened to harbor that religious belief does not mean that the belief automatically gets all of the credit for the works. Christianity has put its support behind few projects compared to how it has squashed that much more skepticism and education in the mass populace for HUNDREDS of years. People believe in Christianity because they want answers and in the past answers were very hard to find due to a lack of scientific progress. People had to explain things some way and Christianity seemed like the most rational explanation and coupled with the concept of eternal damnation for not believing in it, Christianity thrived and spread. People describe their intellectual conquests as searches for God because God to them seems like an answer and they want answers. Had Pascal or Leibniz been any other religion they still would have been "searching" for that religion's deity and doing the same work they would have been doing as Christians. Christianity does not get the credit for their work because their work is based on their genius, not the church's support behind their genius. Furthermore, Dr. King's belief in wanting to stop segregation was bred from common intellect. To say that he needed God to be able to see that segregation was/is wrong is demeaning to his intelligence. Again, Christianity should not get credit for this because Dr. King would have been able to see the flaws in segregation regardless of his religion. sigh. I am NOT saying you need to believe in God to know objective morality exists! Its the complete opposite! You do NOT NEED to believe in God or the Bible to do good things. But ! God needs to exist to be the anchor point, otherwise, everything is all relative. I could say racism is bad, and you would have no recourse to say otherwise. Read William Lane Craig's defense of the Moral Argument. I can't stress this enough – this is a sound argument THAT HAS NOTHING TO DO WITH THE BIBLE OR CHRISTIANITY. You do not need to believe in the bible or that Christianity is true TO BELIEVE God EXISTS! What does God's existence have to do with this? I think you're trying to argue with too many people at once and you may have me confused with someone else. I'm saying the Christian establishment has hurt our world and its people more than helped it and them respectively, and you're talking about objective morality. While I would love to partake in this discussion with you I really don't feel like going into another one right now. People call me an AIDS denialist because I question everything that has been claimed to be the truth about HIV and AIDS. There are many scientists, researchers and educated people who have been questioning what AIDS is and what causes it since 1987. I have done the research myself, read all the important papers, met and talked to many of these experts and so I know something about HIV and AIDS that most people don't. It is a completely fraudulent disease. Old diseases recategorized as a unique disease and caused by a supposed virus that hasn't to this day been properly isolated. If AIDS is caused by a virus, why then can no virus be found in ANY AIDS patient? Yes, that's right. What I just said is true. This is the biggest medical fraud in history and it goes on for political reasons. Most people don't question it we know this. But to see this article about how faith would help put an end to AIDS just further perpetuates a LIE. If this church was really interested in solving the AIDS puzzle, they should start by questioning the hypothesis itself an reexamine the paradigm. If anybody is interested, there are many, many books that very clearly explain the HIV/AIDS fraud and what really causes AIDS patients to get sick including toxic drugs and the AIDS treatments themselves which are known chemotherapies. In Google, type in "Rethink AIDS." As a Medical Doctor with a PhD in Epidemiology I can guarantee you Dennis, you are dead wrong. I do however have some wonder Psychiatrist friends and would happily write you a referral. Get help, please! You are simply dead wrong. Let's see the names of some of the papers and "experts" you have talked to. "If AIDS is caused by a virus, why then can no virus be found in ANY AIDS patient?" -– That depends on which cohort of patients you are looking at. If you take a group of western patients, on anti-retroviral medication(s), their circulating viral load is usually classified as "undetectable" by the labs which do their occasional counts, ie < 50 or < 75 (HIVTAQMAN) and if/when they stop their meds, it would/does skyrocket. Current testing can detect 20 copies if the virus in 1 mililiter of blood. When the viral load is <20, it is classified as undetectable. That undetectable condition is the current focus of HIV research, as the virus "hides" in humans, in some known, and some unknown places, (some white blood cells, maybe some brain phages, and perhaps a few, or perhaps many other places.) The limb you have climbed out on, scientifically, is the equivalent to my saying the earth is flat. Sorry. But Rick, "the" church you speak of doesn't exist. It's nice to lump all Christians together to make this point, but doing so glosses over the fact that some of those churches you include don't agree with the whole premise of your initiative. There are still a great many Christians worldwide who see HIV/AIDS as God's will and a deserved punishment for sinful behavior. Pretending that they will join and help is either terribly misguided or intentionally deceptive. and that is actually irrelevant to the point isn't it? There are "churches" worldwide – does it matter their denomination? nice ad-hominem attack with no facts or arguments to refute anything. Why is it that we can't call your comment W-level stupid? Maybe god loves their suffering, instead. God loves the sinner, hates the sin. Well, above all, God gives us free will. God didn't give them AIDS. The action of humans – the free will of humans – is usually attributed to AIDs. Even those that get AIDS through blood transfusions get it due to the actions of the one who donated the blood and those that mistakenly didn't test the blood, etc, etc. Free will is the best, and worst, of our properties as human beings. God is a lie designed to keep stupid people happy. Grow up. Read more. Ha! Read more. Really – have you read more? I can give you several logical, philopohical and scientific arguments for the existence of God. The Argument from Contingency, the kalam Cosmological Argument, the Teleological Argument, the Moral Argument and the Ontological Argument to name a few. Have YOU read about this? Can YOU refute them? How have YOU educated yourself on these. If you haven't, I recommend reading William Lane Craig, Norman Geisler, J.P. Moreland, NT Wright, Craig Evans, Robin Collins, among others. What's that? You never heard of these people? I guess you aren't as well read as you think you are. Cl78. You simply made a comment about something wich you know very little of just to stir up trouble. You dont believe in god but you question his love. Isnt that ironic, contradictory at best? To question something you dont believe in? Justin. What exaclty do you want people to read to get convinced there is no god? @John What do people read to get convinced there is no god? The bible is a great place to start and exactly where many of us did start. Actually, what you think the Bible says is irrelevant to whether it is true that God exists. After all, Islam could be right, no? Hinduism could be right, no? It doesn't matter. As I've stressed in other comments, Natural Theology can show you through logic, philosophy AND science that it is more plausible that God does exist (as opposed to atheism is true). Argument From Contingency, kalam Cosmological Argument, Teleological Argument, Moral Argument, Ontological Argument are just a few. Read William Lane Craig, JP Moreland, Craig Evans, Robin Collins – get the books "Blackwell Companion for Natural Theology", or "Reasonable Faith" or just go to reasonablefaith web site for free info. You DO NOT NEED the Bible, if that is your hangup, to see that God exists! Now, you will have to ask, "if God DOES exist – could it be that the Bible is right?". At that point, you need to do more study – but again, you don't do that if you just want to know if God exists. John, theres your problem. You believed in the bible, and not God. God is not the bible. It is not a book of proof. It is not meant to persuade you. I hope you werent praying to the bible all those years, its only paper! Since Rick hears voices in his head, did God also ask him to give up his millions of dollars he is making from his business racket? I didn't think so. Rick Warren is a religious entrepreneur. He is running a business. The people who do not see that are intellectually challenged. What a baldfaced troll you are, John. Or should I say Lycidas? Is lycidas a character from the bible or something? Lycidas is another baldfaced troll. You could be his twin brother, you are so alike. It's a miracle! Make that trillions. All religion is a big scam. As much as I dislike Rick Warren, I have to say i'm impressed by his piece here. I was expecting something totally different that focused on promoting abstinence. But he obviously shows a willingness to look at facts and what has been established as effective ways of combating AIDS. still, there was not one argument in that explained why the church was in a special position to combat the issue. Just because there are a lot of churches and religious people around the world? So? this argument assumes that religious people have compassion, even for those people who do not share their beliefs and/or have made poor choices. in my experience, the exact opposite seems to be true 90% of the time. All that money only goes to pay for "abstinence" education, whatever that means. The poor people get no help from this guy. He's just raking in the big bucks just like every other megachurch pastor who worships money. Tamerlane. You either didnt ad the article, or need to reexamine your definition of help. Regardless of how you feel about this guy, how can you say hes not helping by doing this? Teaching abstinence is just saying "don't have s.ex". Now tell me how this could cost hundreds of millions of dollars in Africa, of all places? Tamarlane. Sorry, i thout the article was about him teaching its okay to not be ashamed of aids and helping them not be stigmatized, and thats why he did an aids test. Is he teaching abstinence? I mustve missed something. That's funny when it is religion that causes the stigma, oppression, and false guilt. So more religion is needed to cancel the effects of the religion they are using? Warren is a vocal and shameless anti-gay, etc. megachurch pastor. Tell me how an anti-gay pastor is going to help someone get over being treated badly by that same religion? Or didn't you think that far again? Real world actions have real world consequences. Your religion has no consequences but suckers like you who cannot see past the end of their nose. Remember, it's good people who do good works, and that includes atheists and Realist too. Without good people, it would be the inquisition all over again. Absolutely! The Moral Argument (for the existence of God – see william lane craig's discussion on this) never claims that people need to believe in God to be good. However, the foundation of our moral values and duties IS God. You don't need to believe in God to be good, but God needs to exist for objective moral values and duties to exist. Otherwise, all we have is relativism, "moral values by evolution" and subjectivism. The foundation to doing good lies in the mother, who cared for he child. And later moved on to the father parent. It is in losing a lost one, seeing an unjust punishment to a love one and to feeling pain yourself, is how it began. It is when this world allows male only dominance into organizations of power, do we see unjust, corruption and harm to others. The catholic church comes to mind. As a caring father, I know this for a fact. I was abused and denied by the catholic church and today I only hear the religions deflecting. More denial. Never once have I seen the church stand up and demonstrate what should be done, to set a good example. Instead they blame others and say others did it too. The worst crimes were the cover ups by the popes, bishops and cardinals to deny the small child who needs desperate help. Instead they were threatened, after already abused. Where are the other religious demanding the truth exposed? After all, the truth is the greatest healer. The religious should be standing for the victims. Instead, they don't demand lawmakers expose the truth. The bishops pay lobbyist and promise these lawmakers catholic votes if they deny the victims by stopping laws that would expose. Meanwhile victims committed suicide, others mentally ill as a result of the abuses and mothers cried to their death. Where are the religious? Please don't tell me how great a god or religion is. Objective moral absolutes do not exist. If they did, you would not need a Bible to tell you who to kill and oppress. Face it, moral relativism is all there is. You cannot escape the truth. Your Bible is a book of ambiguous moral relativism. All you can do is guess what it means, but it doesn't mean a damn thing in the first place. It's all made-up moral rules. Or shall we come over to your house to throw large rocks at you to kill you? Surely you have done something worth stoning. All we have to do is interpret it that way. That's how reliable your Bible is. What you just said falls right in line with the Moral Argument! Read William Lane Craig to find out where your line of thinking goes wrong. Who or what defines what you just called "good"? Because, if I lived in 1700s America, I would be inclined to think slavery was good and right. Do you honestly want to tell me that when my mother and father taught me that, that that makes it true? If I were to listen to the atheists, what is true for you is not true for me. I could agree that racism is true and good and there is nothing you can say – because if you think parental conditioning and societal norms makes up good/evil conventions, then when I grew up in the 1700s South, I thought slavery was good. Hey – what's right for you might not be right for me, after all. What IS IT that makes us think objective moral values and duties exist? WHO or WHAT tells us slavery is wrong even though 1700s South thought it was right??? Evolution? Well, in 200 years, who is to say evolution doesn't change us to think slavery is good (after all, we need ditch diggers to survive and perpetuate the species – would be good to have slaves around for that type of work). You said never once have I seen the church stand up and demonstrate what should be done, to set a good example. – this is actually irrelevant to the question of whether God exists. This just proves that man is fallen and prone to sin and can even warp religion to their own benefit. However, by your very words, you show you believe objective morals exist! Your comment does nothing to actually refute that Christianity is true or that God exists. But it does affirm the Moral Argument – read William Lane Craig's articles on the Moral Argument (others do similar things) to understand what this is all about. That is EXACTLY RIGHT!!! You are making my point!! The theistic argument called The MORAL ARGUMENT DOES NOT SAY YOU NEED THE BIBLE. It says the opposite! You do NOT NEED to believe in God to be good!! You are very close to what theists believe! Read William Lane Craig and his defense of the Moral Argument. The question is NOT "do I need to believe the Bible to know objective moral values exist". But, "do objective morals exist". If you are a relativist, then you are saying is it GOOD for you to come to my house and throw rocks and I would have no recourse because "what is good for me is not for you". You are MAKING THE POINT FOR US! Thank you. Ask yourself – "why do you think it is wrong to come over to someone's house and throw rocks through the window?" Is it socio-biological evolution? Is it individual relativism? Social conditioning? None of these explain why OBJECTIVE moral values exist. But you agree they do exist! I can't stress this enough – what you are saying falls right in line with theism and the Moral Argument. I suggest you read up on that argument – William Lane Craig has an excellent defense of it. guest, you are getting me mixed up with "it's good people who do good works"
I am not that person. Your arguments are disjointed as a result. There are no objective moral absolutes. That's why societies make them up on the spot. That's how your Bible got started in the first place you utterly stupid man. ...er.. "to throw rocks through the windows of your house" I meant. Sorry, Rick, the most powerful weapon against AIDS is condom use. What a pretentious twit. Please, leave your imaginary friend out of the argument. At least he is out there helping. What have you done lately? It seems like atheists look at articles with religious themes just to say the same old "imaginary friend" there is no God crap. Maybe if you actually get off your computer and go do something worthwhile, your comment will actually be appreciated... But probably not. That or... a REAL cure. The church CAN'T cure someone of AIDS. A condom may prevent it; a cure will fix it. Tim. Correction. The most powerful weapon is abstinence. A condom can still permit aids transmission. @John Abstinence vows fail too. When it does, let's hope there's a condom in someone's pocket, eh? John. Abstinence doesnt fail if used properly. Im not getting into an argument about vows. Im saying condoms can transmit aids. Abstinence cannot. Simple. John, HIV is transferable through other vectors besides s.exual ones. Abstinence is not going to stop AIDS at all. Wait! Don't tell me! Let me guess! Tamarlane. Calm down. Its sunday. I can see i got you riled up. I was speaking in terms of sxual relevance. I dont think they have a big heron problem in that neghborhood. But calm down, stop being so angry. You are destroying yourself from the inside out. Ill leave you alone now so you can get some peace. Just calm down. Just having a little fun with you, John. Don't be so defensive. If you think your god exists, why not prove it? Shouldn't you give witness to God? Don't you want to defend your beliefs? See, I can be a troll too, but I don't need to lie to do it. Honesty is a powerful trait. Don't teach as fact, what you can not prove. That would be teaching children to lie. Cynicism keeps a person from becoming a fool for every con-artist and religious tract that comes their way. Tamarlane. That would be skepticism. Cynacism just makes someone hateful of everything around them. Perhaps cynicism is just extreme skepticism mixed with righteous anger and contempt. As a cynic, this seems to be the case as far as I can tell. But you wouldn't know how to be skeptical of anything inside your "faith" in the first place, would you. Tamarlane. So are you saying you are righteous? Yes, John, my anger is righteous anger. My skepticism is honest. I speak Truth from my mouth and it cuts both ways like most Truth should. I am for truth, John. It is a very powerful weapon against religion. Religions are not true. If you cannot handle the truth, then maybe you should be sent on permanent vacation somewhere you cannot harm others with your delusions and can be given some easier tasks to do that do not require too much thinking as that would detract from your enjoyment and expression of your delusional religious beliefs based upon nothing but the words of people like you. So, this article was written by Warren to psot on CNN. Hum? Wonder what Rick really endorses? I think I'll go to his Website. http://www.ministryplanet.net/sites/hiv/general_stop_hiv. Has he or has he not taken his eye off the ball? Think he has left condom usage in the dust. Now where does he mention that any money sent to the chruch will go for distribution and educaiton on condom use.